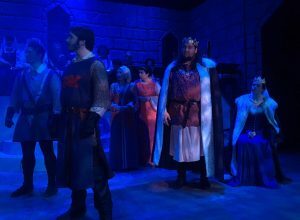 Wayne Mitchell, co-playwright and actor, along with Music Director Seth Eggleston, drop by Stage Talk this week to chat about TBA Theatre’s latest offering; a celebration of Christmas set in 1225 Medieval Europe called Christmas Knight. Four tales, all based on history or folklore that predate much of what we think of modern Christmas will be presented December 8-17 in the E. R. Brown Auditorium in Grant Hall on the campus of Alaska Pacific University. Join Wayne and Seth this week to hear about how they’ve researched and brought to life these adventures full of music, story and fascinating characters. ORIGINAL BROADCAST: Friday, December 8 at 2:45 p.m.